MOSCOW, July 19. /TASS/. An air squadron of MiG-31K fighter jets armed with Kinzhal hypersonic missiles held joint drills with Tu-22M3 long-range bombers in early July, Russian Aerospace Force Deputy Commander-in-Chief Lieutenant-General Sergei Dronov said on Thursday. "Tactical flight drills were held in the first ten-day period of July with the crews of long-range aviation to practice hitting ground and naval targets. The drills focused on planning, preparing and jointly employing Kinzhal air-launched missile systems and long-range Tu-22M3 missile-carrying bombers, and also on fighter jets’ operations to provide cover for air strike groups," the general said. All the assigned combat training missions "have been accomplished highly qualitatively and within the established timeframe" in the course of air maneuvers and "the flight personnel have gained the necessary skills of joint practical actions," he added. The air squadron armed with Kinzhal hypersonic missiles went on experimental combat duty in Russia’s Southern Military District from December 1, 2017, Dronov said. "The squadron’s flight personnel and the engineering and technical staff are successfully mastering new aircraft and armament and improving their skills in preparing and accomplishing combat training missions, including with the conduct of practical launches. Over this period, more than 350 flights have been performed, of which 70 have been carried out with mid-air refueling," the general said. Russia’s MiG-31K fighter jets have been performing planned patrols over the Caspian Sea since April 2018, ensuring strategic containment. Along with the experimental combat duty, test flights continue to expand the Kinzhal combat capabilities. The development of new strategic weapon systems aims to increase Russia’s defense capability and prevent any aggression against Russia and its allies, the Defense Ministry stressed. The Kinzhal air-launched hypersonic missile system was unveiled by Russian President Vladimir Putin on March 1. The Russian leader said the Kinzhal had an operating range of over 2,000 km. The MiG-31K fighter jet is the basic carrier of Kinzhal hypersonic missiles today. During its use, the missile is accelerated by the aircraft to its maximum possible speed and after its release it switches on its solid-propellant engine and gains a hypersonic speed of 10 times the speed of the sound. The Kinzhal missile is capable of maneuvering at this speed and remaining actually invulnerable to the air defense and anti-ballistic missile systems existing today. 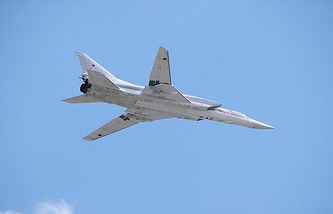 In addition to the range increase, the Tu-22M3 will be capable of carrying several Kinzhal missiles, about which another source in the defense industry earlier told TASS. According to open sources, the Kinzhal was developed using the aero-ballistic missile of the ground-based Iskander tactical missile system with an operating range of 500km.